Persistence Market Research’s newly published report, “Black Pepper Market: Global Industry Analysis (2012 – 2016) and Forecast (2017-2025),” leverages the PESTLE analysis and Poster’s Five Force Model. After a detailed study of this market, our analysts have noticed that the global black paper market is highly fragmented, however it has offered a broad competitive landscape for new entrants to easily enter and capture the market. According to this report bargaining power of suppliers is low since suppliers are large in numbers and competition is high, on the other hand bargaining power of buyers is high as market is highly fragmented. To present a crystal clear picture of the market to our clients our analysts went extra miles to give detail information about market size, forecast, drivers, restraints, trends and opportunities of all the five regions that have been covered in this report. Apart from regional insights, we have also given comprehensive information on various segments and its sub-segments. For the better understanding of the entire market, we have divided the market based on form, source and region segments. As mentioned earlier our report on the global black pepper market is mainly based on PESTLE analysis and Porter’s Five Force Model. Eventually, after covering executive summary and market overview, our expert team of analysts have analyzed the global black pepper market using these two exclusive research methodologies to obtain extensive insights into the global black pepper market that are gradually helping transforming the global businesses associated with the same. The report comprises an in-depth analysis of market drivers, restraints, opportunities and trends that are affecting the growth of the global black pepper market. Furthermore, to understand the popularity of the various market segments and regions, we have included a market attractiveness index with elaborated insights on the same, to showcase the market’s attractiveness based on key metrics such as CAGR, absolute dollar opportunity and incremental opportunity. Finally, the report on the global black pepper market has provided the dashboard view of the companies to compare the current industrial scenario and their contribution in the overall global black pepper market. Moreover, it is primarily designed to provide clients with an objective and detailed comparative assessment of key providers specific to a market segment. Report audiences can gain segment-specific manufacturer insights to identify and evaluate key competitors based on the in-depth assessment of their capabilities and success in the black pepper marketplace. To ascertain the global black pepper market size, we have taken into account the revenue generated by the various manufacturers. 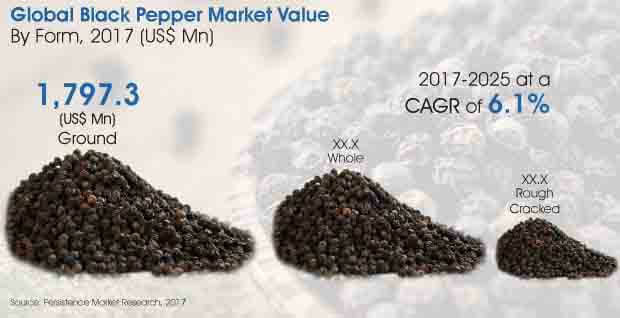 The forecast presented in this report assesses the total revenue generated by value across the global black pepper market. In order to provide an accurate forecast, we have initiated our research by sizing up the current market, which forms the basis of how the global black pepper market is expected to develop in the future. Given the characteristics of the market, we have triangulated the outcome on the basis of three different types of analysis – based on the supply side, downstream industry demand and the economic envelope. In addition, it is imperative to note that in an ever-fluctuating global economy, we not only conduct forecasts in terms of CAGR but also analyze the market based on key parameters such as year-on-year (Y-o-Y) growth to understand the predictability of the market and to identify the right opportunities across the global black pepper market. Growing strategic acquisitions among major players will have a significant impact on growth of the global market for black pepper. Big companies in black pepper market are focusing on mergers and acquisitions to increase their product portfolio. For instance, McCormick & company has purchased 100% of the shares of Botanical Food Company- a privately held company based in Australia that manufactures and sells the Gourmet Garden brand of packaged herbs . McCormick acquires Italian flavoring company for $127 million. Black pepper is known as king of spices and there is lot of scope for new product innovations in black pepper market. Manufacturers are focusing on continuous new product innovations such as essential oils, black pepper spray and fragrances. They are also focusing on innovative packaging of black pepper powder. Black pepper is great addition to one’s diet and is one of the healthiest spice one can ever find. The increasing application of black pepper in various industry are increasing day by day. There are various health benefits of black pepper such as weight loss, promotes skin health, helps in digestion, reduces irritation, improves the dental health and are also used in cosmetic and personal care industry . Black pepper oil could help the consumer to quit smoking. In a study it was measured that the intensity of people’s smoking cravings before and after smelling black pepper oil for two minutes is different. The results showed that the oil could effectively reduce nicotine cravings. Black pepper is one of the healthiest spice among all the spices and seasonings. Now a days rising adoption of black pepper in bakery and confectionary products such as cakes, chocolates, and snacks is fuelling the growth of global black pepper market. For example, black pepper is used in rosemary bread, garlic bread and other bakery products. Black pepper is the most pungent and flavorful of all types of peppers. It also helps to increases the hydrochloric acid secretion in the stomach, thereby facilitating digestion. Consumers are adding black pepper seasonings in their food to increase flavor and taste, worldwide. It is used in different cuisines around the world in both whole and grounded form. Now a days as the trend of using natural seasonings is rising, the demand for black pepper is increasing. The black pepper market demand for ground segment is increasing as manufacturers are rapidly producing new verities in seasonings and blends to increase their product portfolio. The demand for whole black pepper is more in the APAC region because of Vietnam, Indonesia and India having their own production and manufacturing centers, which are rapidly working towards the production of high quality black pepper and essential oil. The segment has been estimated to create absolute $ opportunity of more than US$ 1000 Mn between 2016 and 2024. The optimistic scenario of global black pepper market is estimated to record the growth at a CAGR OF 7.2% to be valued at more than US$125 Mn. However, according to the conservative scenario the market may record a CAGR of 5.9% to be valued at little more than US$ 115 Mn by the end of 2024. In 2017, global black pepper market is estimated to be valued at more than US$ 3,700 Mn, which is estimated to increase at a CAGR of 6.1% over the forecast period to reach more than US$ 5,700 Mn by the end of 2024. The British Pepper & Spice Co., Ltd.
Mahashian Di Hatti Pvt., Ltd.
Indian Valley Foods Pvt. Ltd.